Russia has called on Libya to stop using force against civilians and fully comply with UN resolutions. Russian Foreign Minister Sergei Lavrov, who met two envoys of Libyan leader Muammar Gaddafi in Moscow, said the answer "cannot be called negative". The envoys, he added, urged the rebels to show the same restraint and called on Nato to stop its bombing campaign. Moscow has refused to accept the rebels as the legitimate power, and still has formal ties with Col Gaddafi. After Tuesday's meeting with the Libyan envoys, Mr Lavrov said Tripoli should withdraw armed groups from cities, in line with UN Security Council resolutions. "The main thing at the moment is to agree with terms and timeframe of a truce," he told reporters. Earlier on Tuesday, explosions were heard near Colonel Gaddafi's residence in Tripoli. Libyan officials later took reporters to the area and showed them the buildings, which were on fire after being hit in what appeared to be Nato air strikes. A government spokesman said one of buildings was a security services office. In a separate development, the International Criminal Court (ICC) chief prosecutor pressed on Monday for the arrest of Colonel Gaddafi. Prosecutor Luis Moreno-Ocampo said Colonel Gaddafi, his son Saif al-Islam, and intelligence chief Abdullah al-Sanussi bore the greatest responsibility for "widespread and systematic attacks" on civilians. ICC judges must still decide whether or not to issue warrants for their arrest. The Libyan government has already said it will ignore the announcement. 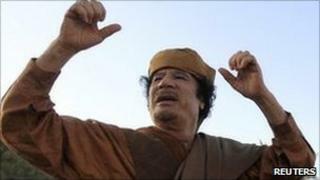 The uprising against Col Gaddafi's rule began in February, sparked by similar uprisings in neighbouring Tunisia and Egypt. It developed into an armed conflict pitting rebels - who control Benghazi and other eastern cities - against the forces of Col Gaddafi, who retain Tripoli and the west. In March the United Nations approved a resolution authorising "all necessary measures" to protect civilians. Russia was one of five nations to abstain in the UN vote, and has argued that the Nato campaign goes beyond the UN mandate.